What do dollar signs, anchors and bacon have in common? They’re all menu psychology tactics used to make food truck menus more enticing to prospective customers, of course. The bottom line is the bottom line: You want diners buying food. And you’re lucky; before your diners even decide what they’re going to order, you’re putting an advertisement in front of them, in the form of a menu or menu board. Today we’ll discuss the top 6 tips of menu psychology that will lead your food truck customers to order what you want them to. This is menu psychology 101: DO NOT use dollar signs ($$$) on your food truck menu. 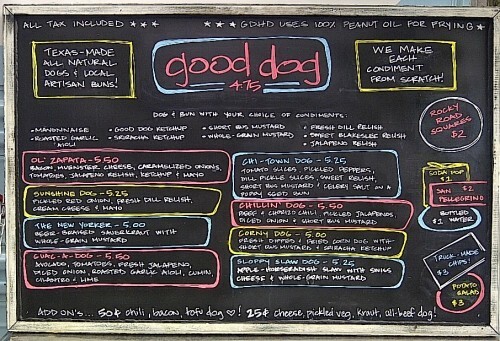 We’ll repeat that if you missed it, do not use dollar signs on your food truck menus or menu board. It forces customers to focus on the price of the item rather than on the item itself. Is your menu a list of prices or of meals? One of the best ways to compare numbers is to have them all lined up. So give your diners a break and get them focusing on the food and not the price. Columns force your diners to compare the prices of all your dishes, making them weed out the most expensive rather than focus on the most delicious. However, pricing all your entrees around the same can be a good tactic to prove to your patrons that you are a fairly priced eatery. While using simpler copy is certainly a trend, the words you do use must be precise. Dr Brian Wansink, director of the Food and Brand Lab, found that descriptive labels on menu items increases sales by as much as 27 percent. Bracketing is for the same-dish-that-comes-in-two-different-sizes trick. The two sizes prompt the diner to feel a bit worried that the smaller portion might not be enough and reassure them that for less than double the price, they can get twice the amount of food. Deal, right? Well, sort of. If a customer doesn’t eat the extra food and doesn’t take it home to finish, then, both the food and the consumer’s money are wasted. However, if you’re the food truck owner, you just made close to double the profit off of that sale, simply by having two sizes. Just as with newspapers, the upper right hand corner of a menu is prime real estate. This is the first place a diner’s eyes go. Putting something especially enticing or your signature food truck dish there is a good call. If your pork dish is listed just as a pork dish, chances are customers would glance over it and keep moving to the next item. However, when that pork loin is bacon-wrapped, everything changes. Bacon is still a buzzword for many food truck diners. They always seem to be enticed to see what the tasty, salted pig-part has been paired with this time. The most successful food trucks lure customers in with great tasting food. But more subtly, they get inside consumer heads to make help them shell out and chow down. A food truck’s menu needs to be designed to get your guests salivating. When you break it all down, a well designed food truck menu is as complex as the periodic table. Do you have other menu psychology tips that have been successful for you and your food truck? Share you thoughts in the comment section below, Tweet us or share them on our Facebook page.